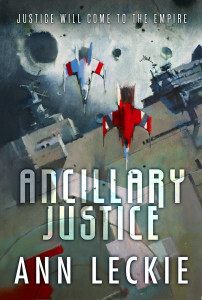 I’ve been hearing rave reviews of Ancillary Justice everywhere, so when I finally got my copy, I pounced on it and finished it that very night. Despite the sky-high expectations, I was not disappointed – it’s one of the best books I’ve read this year. The protagonist of Ancillary Justice is Breq, the sole remnant of the sentient starship Justice of Toren of the Radch Empire. She (it?) has been seeking vengeance after the rest of her was destroyed, and on a remote, icy planet, she’s getting close to the end of her quest. I don’t want to say any more about the premise because anything I say would focus on only a small part of what this book encompasses, and I think that would be doing it a disservice. Breq’s viewpoint is fascinating – she is someone who is accustomed to perceiving and processing millions of things in many different locations and ways – sometimes through pieces of mechanical equipment, sometimes through human bodies (called ancillaries). She looks human but has never been human, so the things she pays attention to and the thoughts she has are very different. The story alternates between Breq’s present quest, and the events that led to it (when Breq had her full capabilities as Justice of Toren), so we see her character evolve (devolve?). Ancillary Justice examines humanity in an incredibly compelling way – by omission. Breq pays absolutely no attention to the fact that her ancillaries were once fully human, or to other characters’ dismay over that fact. There is one disturbing scene where a new ancillary is connected to the ship, and the only thing the ship comments on as it squelches the human’s memories is that it is irritated that the host doesn’t know any new songs that it could learn. The way supporting characters feel is also clear through Breq’s narration – some are in love, some are scared, but much of the time, Breq has no awareness of what their actions mean, or even of her own feelings. Many of the other concepts in this novel are also explored via omission – individuality and gender are two examples. Justice of Toren‘s individuality is murky – each ancillary unit has its own personality (or maybe just Breq’s origin – One Esk? ), but they’re part of the ship. The Lord of the Radch, Anaander Mianaai, further adds to this murkiness – supposedly she is a single entity with thousands of genetically identical bodies – but is she? Gender is similar – The Radch Empire is a post-gender society, and Breq has a really hard time identifying people’s gender in other societies. I tried really hard to keep track of people’s “real” genders for the first few chapters, but then came to realise it didn’t matter at all. Despite all the hard science-fictional concepts, Ancillary Justice never gets lost in its own ideas – it is well-paced and extremely readable all the way through. I could go on and on about pretty much everything in this book – the worldbuilding, its exploration of another half a dozen concepts, the characters, and much more, but instead I’ll just tell you that this is one of the most original and ambitious books I’ve read, and exhort you to read it as soon as possible! This entry was posted in Books, Reviews and tagged book 1, fiction, science fiction by Kriti Godey. Bookmark the permalink.